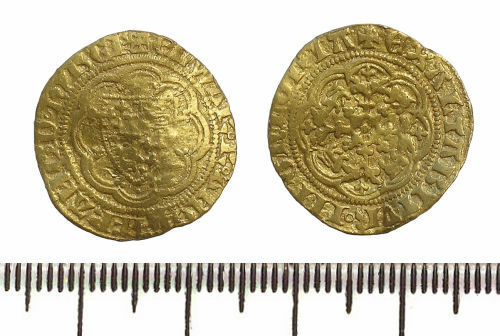 A gold Quarter Noble of Edward III. Fourth coinage, pre-treaty period issue, 1351 - 1361 AD. The coin is slightly worn and bent. It measures 18.5mm diameter by 0.3mm thick and weighs 1.83g. Obverse description: Royal shield within a tressure of six arches, annulet stops in legend. Reverse description: Cross within a tressure of eight arches, pellet at centre.